The escalating trade war and other headwinds will rein in Singapore's economy next year, the Trade and Industry Ministry said yesterday. It forecasts economic growth of 1.5 per cent to 3.5 per cent next year, a drop from the estimated 3 per cent to 3.5 per cent expansion this year. The biggest risk would be the loss of global business and consumer confidence if the trade war between China and the United States intensifies, said MTI permanent secretary Loh Khum Yean. Mr Loh told a briefing at the Treasury yesterday: "Should this happen, global investment and consumption spending would decline, with adverse impact on economic growth." This means the outlook for demand is slightly weaker next year compared with this year, with more risks for the global economy. However, Mr Loh noted that the trade war has not had any discernible impact on Singapore's economy yet as most of the tariffs kicked in only recently, and their effects will likely appear towards the end of the year. Signs of a weakening economy are already evident here, with the third quarter expanding at the slowest pace this year. Growth came in at 2.2 per cent in the three months to Sept 30 compared with the same period last year, and was well down on the 4.1 per cent expansion in the second quarter. The 2.2 per cent figure fell short of the 2.4 per cent consensus forecast of analysts polled by Bloom-berg and the MTI's 2.6 per cent advance estimate. The ministry said growth was supported mainly by the finance and insurance, manufacturing and business services sectors. Most industries saw slower expansion or contraction. Manufacturing grew 3.5 per cent over the third quarter last year, down from the 10.7 per cent expansion in the second quarter. 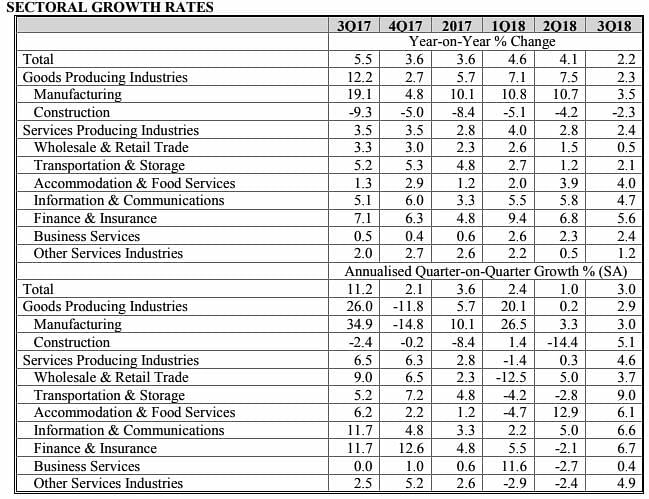 While most segments grew, the general manufacturing cluster shrank due to declines in the printing and miscellaneous industries fields. Construction contracted 2.3 per cent in the third quarter, but that was better than the 4.2 per cent year-on-year decline in the second quarter. The third quarter was hit by reduced public sector building. The sector should improve next year as the larger number of contracts awarded in the second half of last year start to bear fruit, said MTI economics director Yong Yik Wei. Wholesale and retail trade grew by 0.5 per cent year on year, moderating from its 1.5 per cent growth in the second quarter. Manufacturing is expected to slow from its surge over the past two years, but Mr Loh tips services to pick up the mantle as the main driver of gross domestic product (GDP) growth next year. "We expect that balance to shift somewhat going into 2019, when manufacturing will see more moderate growth," he noted. "For services, while it will also be impacted by the moderation in growth in advanced and regional economies, domestic services will provide some resilience." DBS Bank senior economist Irvin Seah said the quarter-on-quarter GDP figures show a degree of resilience in the economy. "That said, there are concerns regarding the risk aversion and faster-than-expected hikes in interest rates causing excessive volatilities in the financial markets, and property cooling measures weighing down on the business service and construction sectors in the coming quarters," he said. "A trade war could also add salt to the wound in the near term."